Successfully Added SYMA X8HW FPV Quad Copter - 6-Axis Flight Control, 3D Flip, Headless Mode, Auto Hovering, 1MP Camera, Wi-Fi to your Shopping Cart. 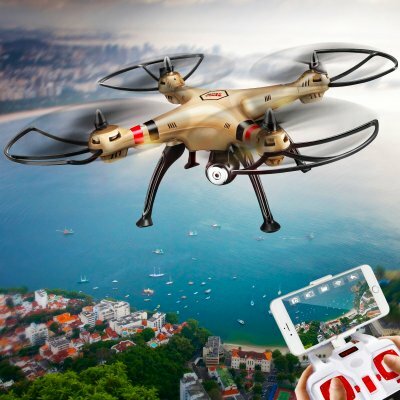 The perfect drone to lean tricks and pick get a taste of aerial photography the SYMA X8HC comes with easy controls and flight modes making it the ideal gift for a beginner or drone enthusiast looking to hone their skills. The SYMA X8HW drone uses the latest 6 axis flight control system to bring stable flight and with its advanced built in barometer it can automatically maintain the flying altitude in hover mode. For simpler navigation the quad copter has a headless flight mode so when you push forward on the controller it will always flight away from your and by pushing backwards the drone will return it to you, regardless of where is pointing. This makes it easier to navigate in daily light and at altitude when the colored orientation LED lights may not be so visible. Able to pair directly to your Smartphone via the drone's built in Wi-Fi, the SYMA X8HW quad copter brings a stunning FPV (first person view) of all it surveys. By simply installing the free Smartphone app on your Android or iOS device you can see a bird's eye view from the copters 1MP camera. To enable easier smooth photography the done has an altitude hold mode so camera it can maintain the same high without additional input allowing you to focus on recording stunning video footage. A 1MP camera comes included with the drone and records direct to a micro SD card, (4GB card included). With a 1080 by 720 resolution you can get great video footage or line up and snap pictures with superb accuracy as the real time Wi-Fi transmission lets you view it all directly on your paired Smartphone. A control range of up to 50 meters ensures the done wont stray too far and remains visible when in use while its rechargeable 2000mAh battery brings around 6 to 8 minutes of flight time. plenty for you to pull of some 3D flips and record short action videos or scenic vistas. The SYMA X8HW quadcopter brought to you by the leader in electronic devices as well as wholesale done and RC toys..